Sometimes you need to blow things up and start from scratch. I have been having some functionality issues with my site, and I apologize for slow load times and a lack of posting. Behind the scenes I’ve been working on developing a whole new site that I’m hoping will be up and functioning in the next few weeks. It’s been difficult to be motivated to post when half the time I can’t even get a post to format correctly. On the plus side, I’ve been working on my photography, and I think it’s finally coming along. It’s so frustrating to have this image in your head that you are trying to capture and then be unable to use your camera properly to achieve it. I must admit if it weren’t for the photography, my blog wouldn’t exist. I’ve found that it’s frustrating and stressful always trying to innovate new recipes and writing is something that I feel horribly inadequate at. But put a camera in my hand and a rush of excitement hits me. There are times when I am full of regret that I discovered my passions relatively late in life. In my late teens and early twenties, I had no ambition or interest in anything that might lead to a career. I know that it’s counterproductive to wish you could go back and make different choices in life, but I guess that’s human nature. Moving to Portland inspired me creatively. Before that, the only thing that excited me or that I considered myself good at was shopping. It’s disturbing to think that I spent the first thirty-five years of my life browsing for the next thing to buy. One of the biggest benefits of living in Portland is the proximity of fresh food that is available everywhere you turn. One of my greatest pleasures is browsing my local farmers market looking for inspiration. 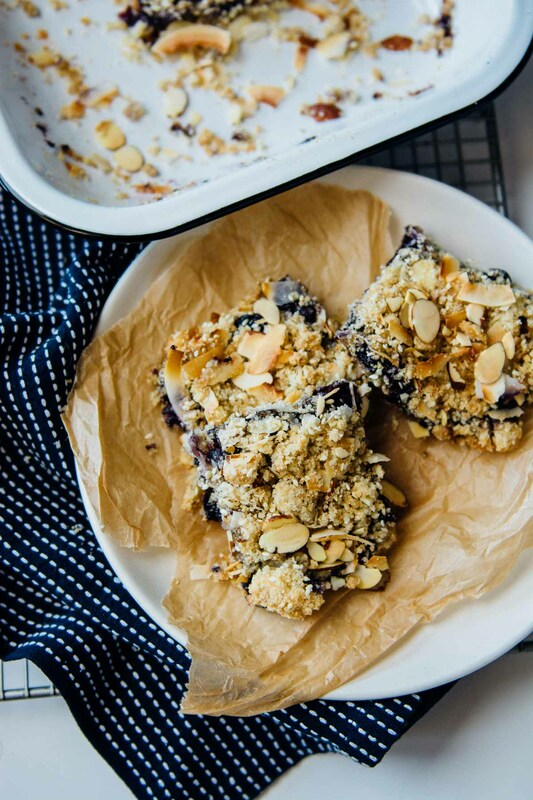 We are in the thick of berry season, and the blueberries are just amazing right now. 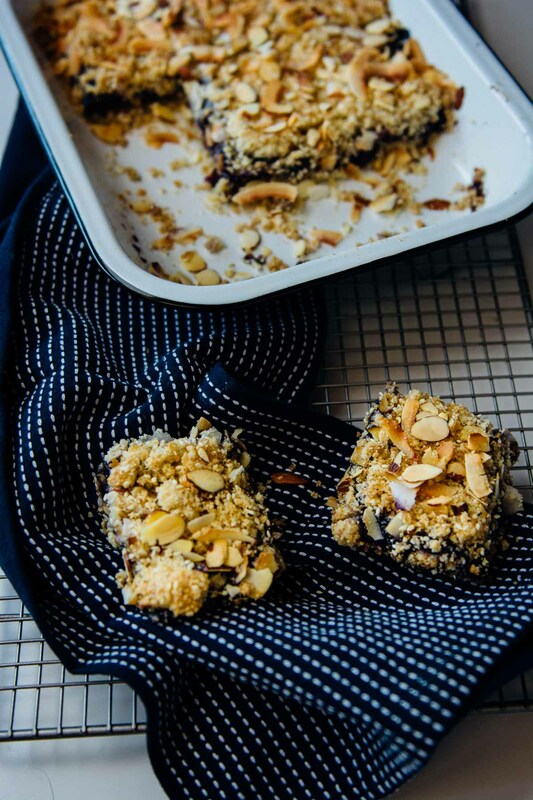 I’ve made a strawberry version of these bars before, but I wanted to mix up the ingredients to highlight the berries first and foremost. 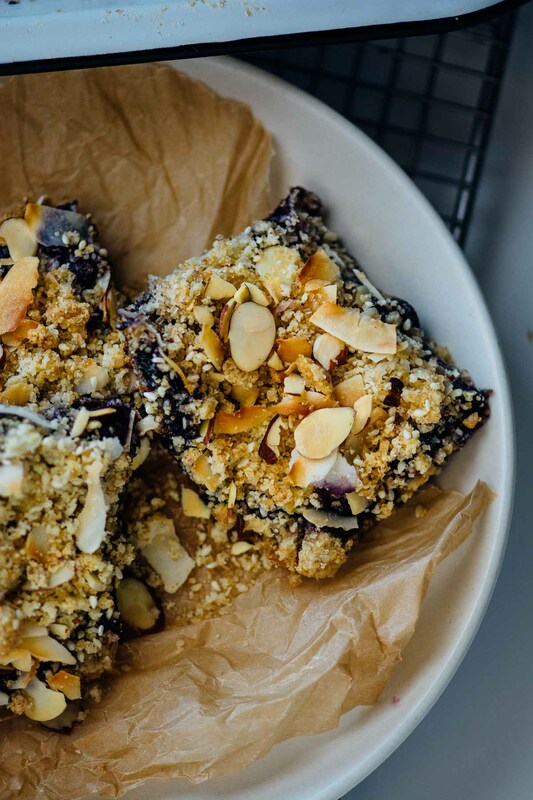 These blueberry coconut bars are a great breakfast on the run, afternoon snack or a great take-a-long for a summer picnic. I made a super easy chia seed jam with some blueberries, lemon, maple syrup and a few sprigs of thyme to add a savory note. The result is reminiscent of a peanut butter and jelly sandwich. 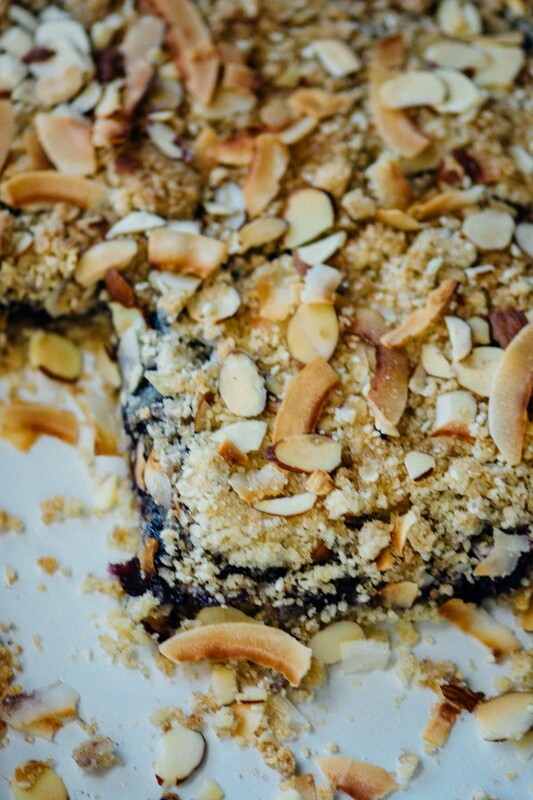 The crumb is a mixture of almonds and oats that are finely ground into a flour and paired with the not too sweet jam. Every day is full of the possibility to grow and learn something new. I have been going through a lot of transition in my life and this blog is one area that I can rely on to ground me and give me focus. Thank you so much for taking the time to try my recipes, comment on my ramblings and enjoy my photography. 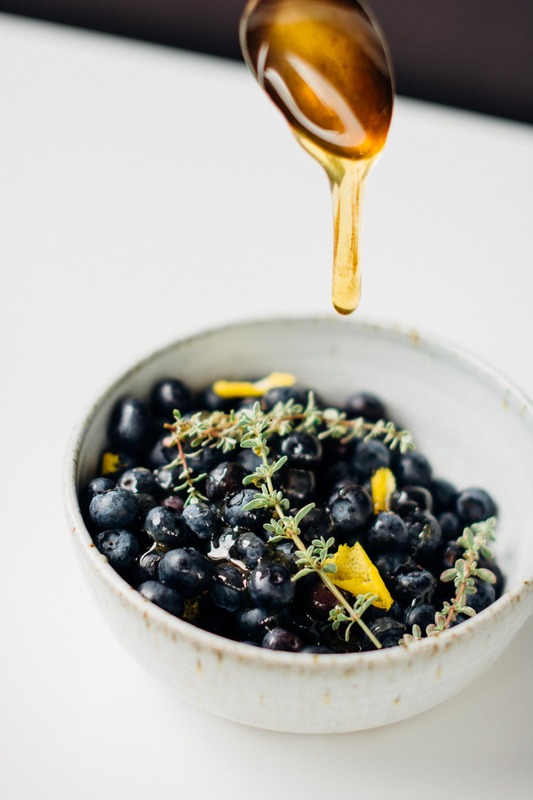 In a medium saucepan, combine the blueberries, with the honey, thyme, lemon juice and zest. Bring to a simmer and cook until the mixture has thickened slightly about 5-8 minutes. Add the chia seeds, remove from the heat and let cool. Once cool, refrigerate the jam for at least 30 minutes or up to overnight. I usually make the jam the night before and let it set up in the refrigerator; it will thicken as it cools. Pre-heat the oven to 350 degrees and oil an 8x11-inch pan. 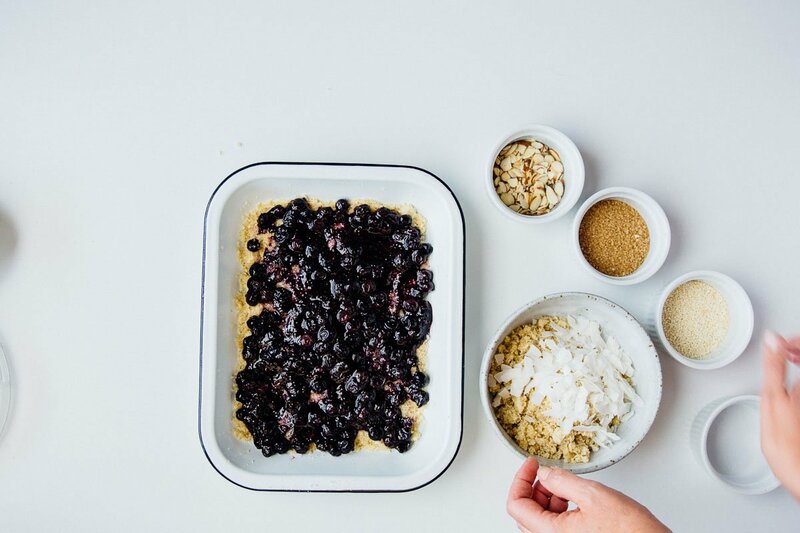 Combine the flax meal with the tablespoon of water in a small bowl, mix well and let sit for 5-10 minutes while you prepare the rest of the ingredients. 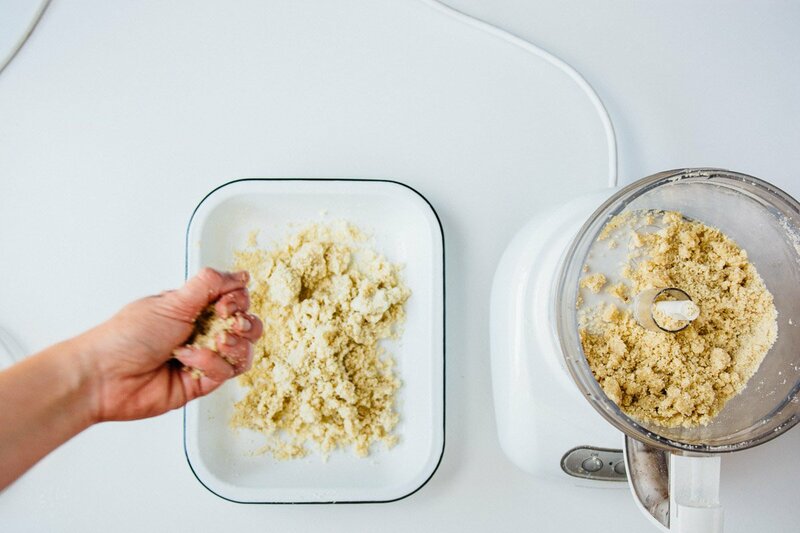 In the bowl of a food processor fitted with a metal blade, pulse together the almond flour, Spelt flour, coconut, and sesame seeds until they start to form a coarse meal, about 30-45 seconds. Add the cane sugar, salt, baking powder, flax egg, coconut oil and pulse to combine. Add the ice water a tablespoon at a time just until the mixture holds together if you squeeze it between your fingers. Press half of the crust mixture evenly into the bottom of the prepared pan. Pour the chia jam onto the crust and spread evenly. 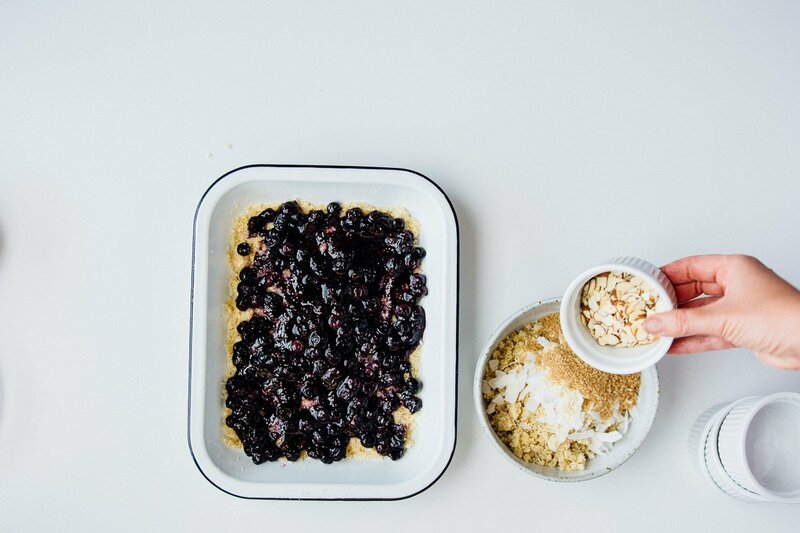 In a small bowl combine the coconut, raw almonds, sesame seeds and turbinado sugar for the topping. 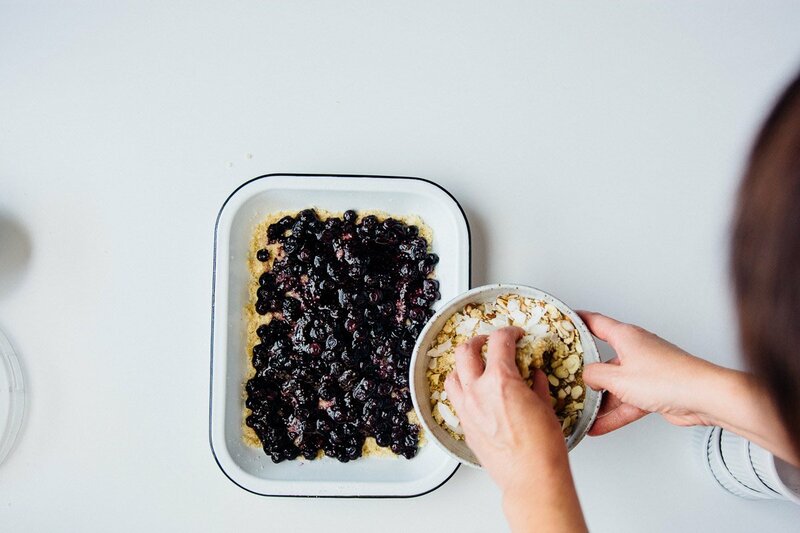 Take about half of the topping and lightly mix it into the remaining crust mixture and scatter it across the top of the jam, trying to cover most of the pan but don't worry if it isn't perfect, that's not what we're looking for. Sprinkle the rest of the topping over the top. 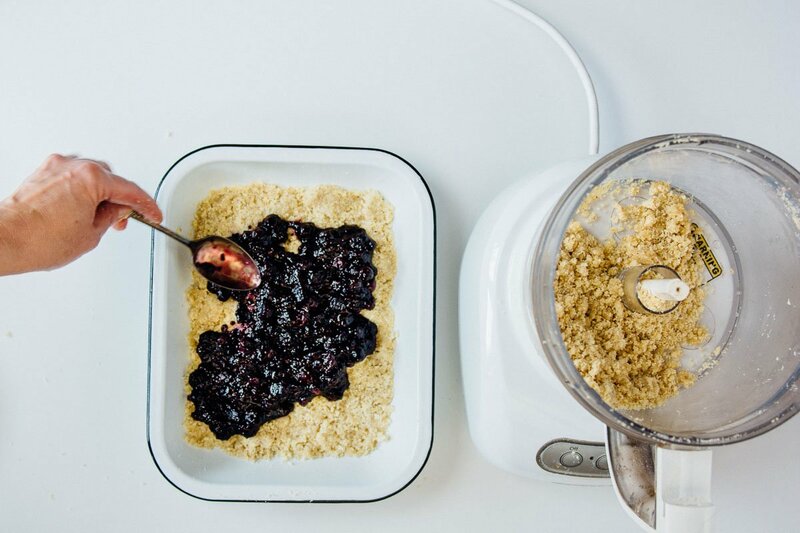 Bake until the crumble is golden brown and the jam is bubbling about 30 minutes. Let cool completely in the pan. Slice into bars. If wrapped and kept at room temperature, the bars will keep for 3 days.